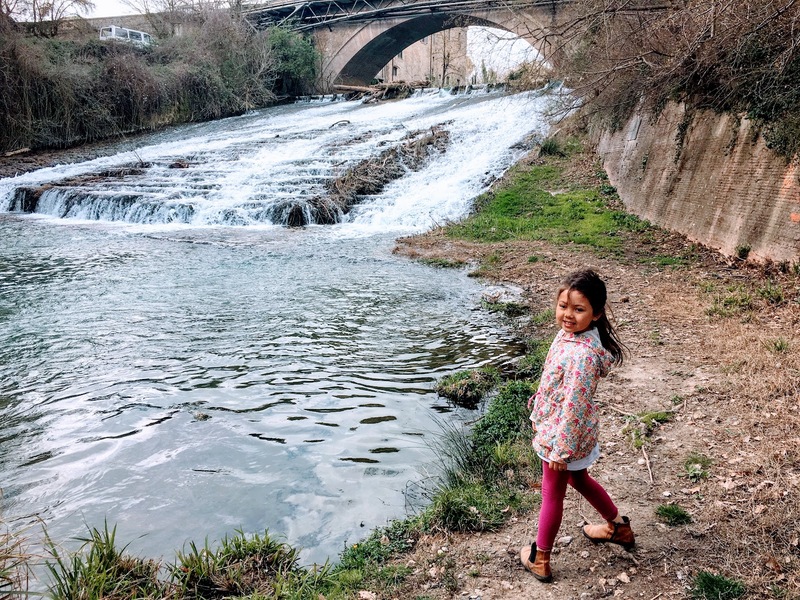 We spent a week of Eliana's Spring Break staying at an agriturism hotel in Tuscany. During the week we took many day trips into surrounding towns, however on one day we decided to stay near our farm and do a hike along a river on the SentierElsa Trail. Because our dog, Finnegan, was diagnosed with a fast growing cancer a few days before our trip we decided to bring him with us to Tuscany. This hike was one of his last longer walks and I think he enjoyed it a lot and we will cherish the time we had with him on this day. The hike itself is not long. It is 2 km one direction and so a total of 4 km roundtrip. It follows the river the entire length of trail and crosses it several times. The children didn't complain once of being tired which I always find a good sign for a family hike. They were so intrigued with the flowers, gushing water and bridges that they were easily urged along - often times running in front of us leading the way. The hike starts at the bridge of San Marziale just outside of Colle di Val D'Elsa. When crossing the bridge you will see a sign that says "Inizio del Sentierelsa" and steps leading down toward the river of which the bridge is crossing. We were able to find a free public car park very nearby here. The walk from the car to the start of the hike was less than 5 minutes. The bridge photographed in the photo above is the bridge of San Marziale where the trailhead begins. We had just walked down the steps that lead from the bridge toward the river. When not crossing the river itself, the trail is well marked and easy to follow. It is mostly a dirt and gravel path with a few handrails at times where it is steep or near a drop-off, however I wouldn't trust the handrails at all times. We saw several areas where the handrails had been broken or were very wobbly. Steps with handrail. Handrail broken or "wobbly" in a few areas. The trail is not stroller friendly as there are several steps and also some areas where you have to cross the river while balancing on large rocks or stepping stones. The children were enthralled with the number of waterfalls throughout the walk. The river gushes over large boulders and sometimes falls for a long distance. There were short and long waterfalls throughout the walk, some of which would be wonderful to play and splash in if the weather were warm enough for swimming. Of course, others were too big to play in, but were fascinating to look at. We also watched several fly fishermen in action as they stood in the middle of the river. If the weather had been just a little bit warmer, I imagine Eliana and Lucas would have been swimming and splashing along on the hike. As it was, they straddled the edge of the water very closely throwing rocks and splashing with sticks. For link to our photo album from the Sentier Elsa trail click HERE.